A couple of days ago I was sitting outside with a neighbour while the kids hung out in the paddling pool. We were complaining about the heat and how our flats got hotter and hotter by the minute. She said she tried to avoid cooking because of the additional heat that a hot oven would produce. I then told her that I was doing the opposite because this kind of weather was the best weather for baking. When the heat wave started I stirred together a new batch of sourdough starter. And I made lye pretzels. Because when it’s 26°C in your kitchen you cannot mess up a yeast dough. Although I really am the first person to complain about high temperatures outside and inside, I am also glad for this opportunity to get back into baking. More boring bread posts will for sure follow. Laugenbrezeln aka. 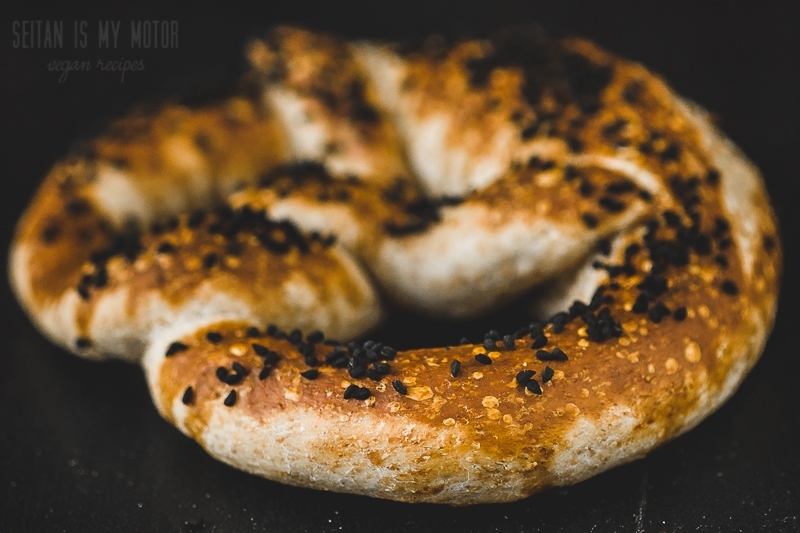 soft pretzels made with lye have always been a favourite baked good of mine. You can read a lot of stuff online about how dangerous it is to make your own lye pretzels at home. People love to recommend baking soda as a safe and easy substitute. But I am still not convinced. No, I really don’t think pretzels made with baking soda taste like those made with lye. Sue me. The lye you use for baking pretzels is called sodium hydroxide. I have written a long post before about how to use the lye. You can read all about it here. Working with sodium hydroxide is really not that dangerous in my opinion, if you keep in mind a couple of precautions: Wear gloves and long sleeves, avoid skin and eye contact, and keep children and animals out of the way. Laugenbrezeln are usually made with white flour and water and even though I am all about tradition when it comes to using lye, I am not as strict when it comes to the ingredients. So I made a richer and slightly more nutritious version with coconut milk and a little bit of whole spelt flour. And since everyone in this family usually scrapes off the salt before eating their pretzel, I made my pretzels without salt. 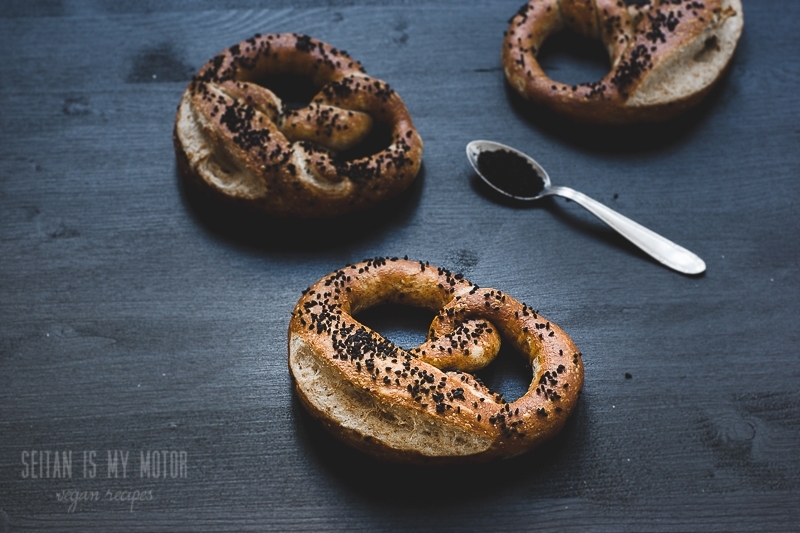 It was replaced by aromatic nigella seeds (also called kalonji or black caraway), which made these pretzels really special. Combine the flours and mix well. Add yeast, liquid and salt. Knead well for 5-6 minutes. Place in a bowl and let rest for 1 hour, until doubled in size. Wear gloves and long sleeves while carefully preparing the lye: Add cold water to a large pot. Dissolve the sodium hydroxide in the water. I used a wooden spoon for stirring. It is important to put the sodium hydroxide into the water and not the other way round! (You will cause a violent reaction if you pour water over the lye granules.) Set aside and make sure there are no kids or animals near the solution. Preheat the oven to 220°C (428°F). Line two baking sheets with parchment paper. Divide the dough into 10 equally sized pieces. Roll each into a 65 cm (25.6 inches) long log. The middle of this log should be thicker than the ends. (You can see how they are shaped here.) Brush the ends with water, shape into pretzels and place on a baking sheet. Put on gloves again and use a silicone brush to brush the pretzels with your prepared lye solution. 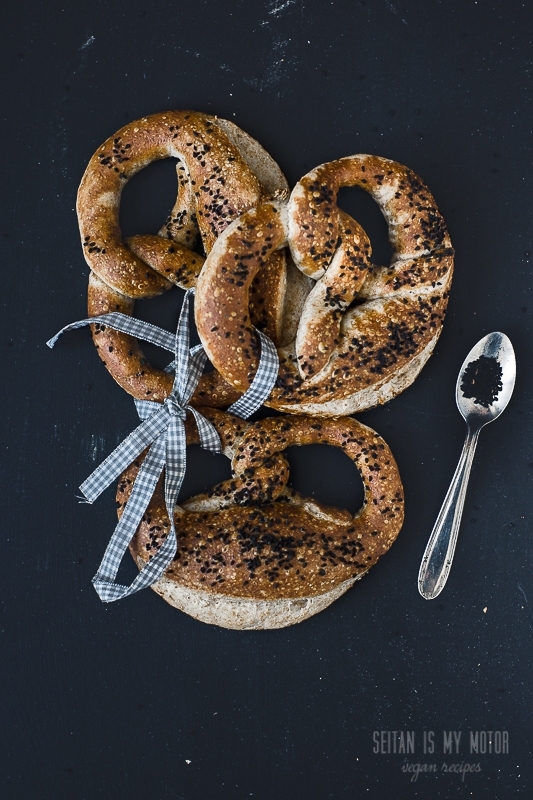 Sprinkle the nigella seeds on top and slash the thick part of the pretzel with a sharp knife. Let rise for 10 minutes, then bake until browned, for 16 minutes. Let cool completely. Note: Store the lye solution in a glass jar for another batch of pretzels or use it to clean your plug holes. Make sure to store it in a safe place. Keep it away from children and animals and make sure to label it! To protect your skin and eyes always wear gloves while handling the solution.